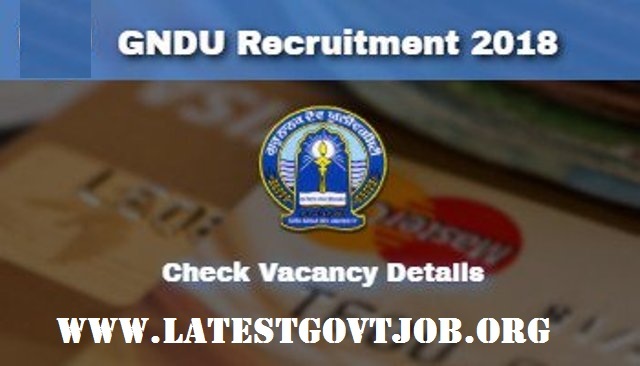 GNDU Recruitment 2018 for Assistant Professor 456 Vacancies @online.gndu.ac.in : Guru Nanak Dev University (GNDU) has released a notification for the recruitment of 456 Assistant Professors in Main Campus, Regional Campuses, University Colleges and Constituent Colleges. Interested candidates may check the vacancy details and apply online from 17-05-2018 to 28-05-2018. Candidates should have passed Graduation Degree in any stream with minimum 55% marks OR qualified UGC NET from a recognised university. Selection of candidates will be made on the basis of Computer Based Written Examination/Personal Interview. Interested and eligible candidates may apply online through GNDU website - http://online.gndu.ac.in/ - from 17-05-2018 to 28-05-2018. Candidates have to take 2 printouts of the Application Form and affix the same passport size photograph (which was uploaded with the online form) on it and SEND a COPY to 'THE REGISTRAR, GURU NANAK DEV UNIVERSITY, AMRITSAR-143005, PUNJAB' along with photocopies of education certificates and address proof. Candidates must keep 2nd copy with them.